I’ve been waiting for our garden to produce the first asparagus of the spring so I could share my very favorite asparagus recipe with you. 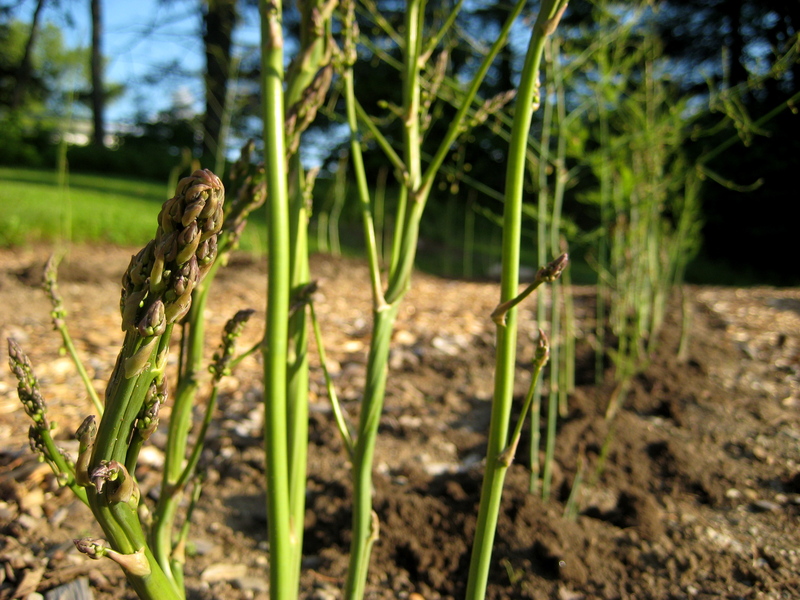 The 1st asparagus spears of the season are always cause for great celebration! But, spring comes late to northern New England, and your asparagus season might be long gone by the end of April, when I expect our season to begin. Once asparagus unfurls it's branches, it's past its prime for harvest. A simple recipe to showcase the complex flavors of fresh asparagus. 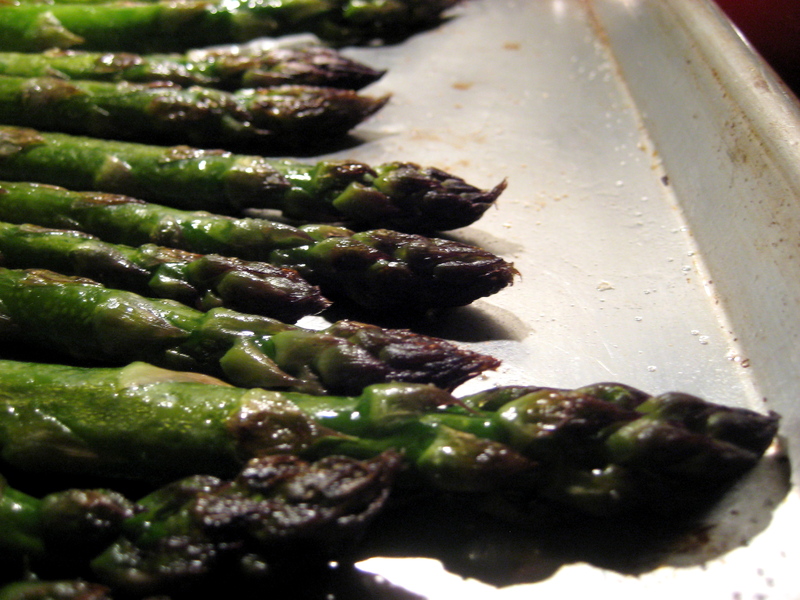 Place washed & trimmed asparagus spears on baking sheet. Drizzle with olive oil & sprinkle with salt. Roast 8-10 minutes, turning once. Remove from oven (and purely optional: sprinkle with a bit of lemon juice or balsamic vinegar). To ensure even roasting, choose spears of similar thickness, or remove thinner spears first. 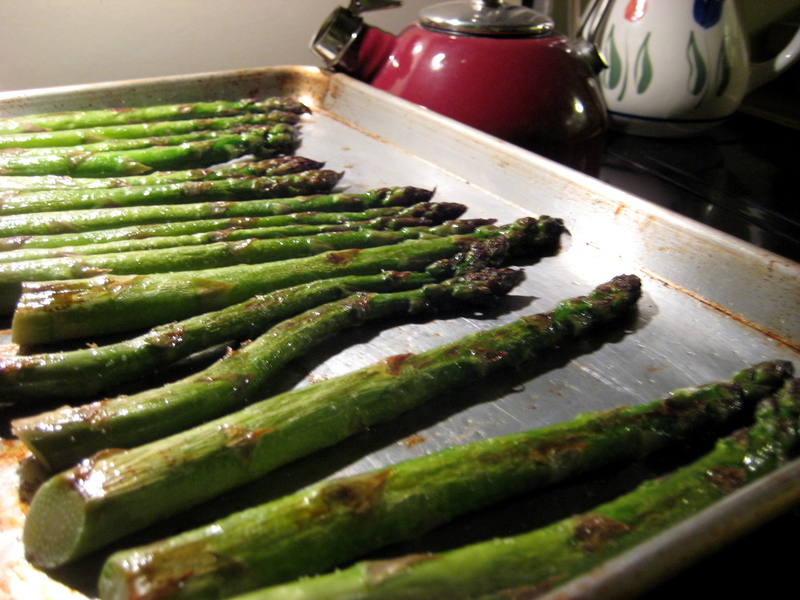 Asparagus will brown & caramelize during roasting, adding a rich, wonderful flavor. The fresher the asparagus, the better this recipe! 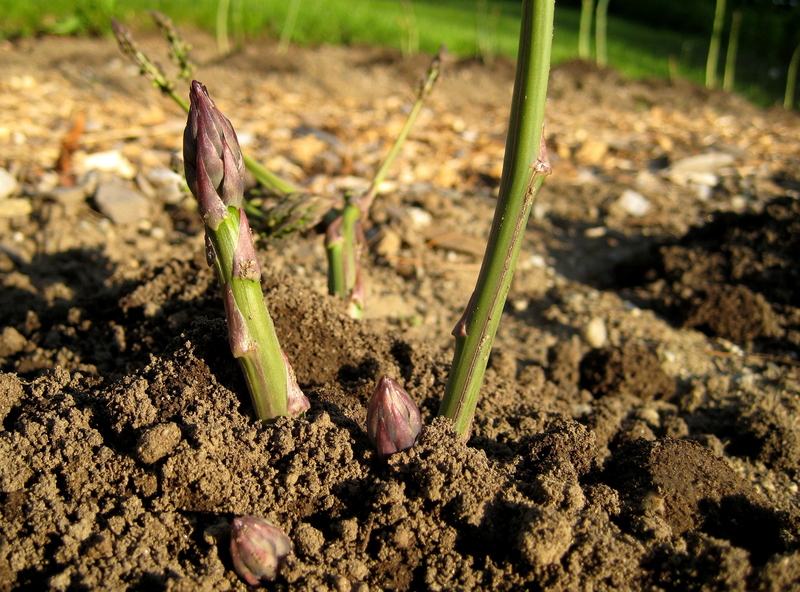 This entry was posted in Gardening, Recipes and tagged how-to, roasted asparagus by Carrie Cahill Mulligan. Bookmark the permalink. I agree: fresh asparagus like this should be done as simply as possible! Love the early spring photo of the little spears just peeking out of the soil. Have you tried doing the same thing over indirect heat on a grill? YUM. I agree. That is the best way to prepare asparagus. But I cannot believe you have them already. Not a sign of any green tips in our garden in Woodstock. I’m getting antsy for it to start, though (can you tell?)! That’s my favorite recipe, too! You know, Patti, before we grew asparagus, I was all about the hollandaise. But now that I’ve had super-fresh asparagus, I’m all about tasting the asparagus…. Unfortunately no. We have about 2 inches of soil on top of shale. I’m lucky I can get a few tomato plants in the ground. I’d love to have a raised bed full of veggies. How would I keep the rabbits and deer from eating it all?